This is a wonderful place for loved ones to stay who need extra care. The environment feels like home and the staff are compassionate and professional! This place has been a blessing to our family, caring for two of my relatives. GREAT, WONDERFUL, LOVING, SUPPORTIVE, a answer to PRAYER!! The Perryman House was a wonderful place for my dad. He went to other assisted living facilities, but my dad needed that extra love and care he got a Perryman. The whole staff ( nursing, kitchen, admin. staff, etc. ), and the residents are like one big happy FAMILY. The BIGGEST blessing was when my dad was hospitalized Kathy had a staff member when him all the time (especially when we the family needed to go home and rest). So he was never alone! I could go on with wonderful words for the Perryman House, but the best is the name of ALMOST HOME: Perryman House. I honestly don't know what I would have done with my sweet mom if it weren't for Kathy and the team at Almost Home. For anyone who needs individual, personalized care in a nurturing environment with an unmatched caregiver to resident ratio, you cannot find a better place than Almost Home. The home is exceptionally clean. Open space providing patients with space to move about in; nurturing and calm environment. Easily tell staff puts patient's needs first. No adverse odors, puts very clean, well dressed staff, very compassionate, empathetic and respectful of patient's needs. The care has been excellent. They really care from the heart. Almost Home is very homey and clean. They have group activities for the residents. "Almost Home" is a misnomer. It should be called "Better Than Home". I cared for my beautiful Mother for many, many years in my home. However, there was no way I could provide the care that these angels did at Almost Home. Love abounds here. Instead of regressing, my Mom flourished. Conversation, Singing, home cooked meals, games, walks, manicures, pedicures, hair styling, daily devotions, outings, on site medical care...everything is done with the most unbelievable love! The best place in the WORLD for the one you love! Notice the word used most here...Yes, LOVE! The Almost Home Group was like a dream cone true. Although we took great care reviewing assisted living ratings and conducting personal visits and interviews before choosing a facility, it became apparent that they were unable to provide the attention needed to adjust to a new environment or to address the care and understanding for someone in the late stages of his disease. As a result, we knew memory care assisted living was not a good fit or an option going forward. We are blessed to have found The Almost Home Group that provides the most wonderful care and attention to their residents that have a variety of diagnoses and needs. The home setting is cozy and comfortable with 24/7 care and attention. I have heard a number of times from staff how glad they are to be associated with any of the three residence under The Almost Home Group umbrella because they feel they have the latitude to do what they want to do related to their career choice and are meant to do, take care of their patients/residents. I feel fortunate he is in such and environment and finally have peace of mind related to his mental and physical health. My mother had been in different assisted living and skilled nursing facilities. She had many experiences with hospital admissions because of her falls. She would be sitting in the hallway lined up and no one was acknowledging she was there. We read an article about Almost Home Group in the newspaper. We were interviewed by Kathy and we were so very impressed. I love that they have compassionate and caring caregivers. There was never a moment that somebody wasn’t there to take care of whatever the residents’ needs were. If a patient is crying, someone would respond immediately. Our experience with the previous facilities had been nothing like The Almost Home Group. I have peace of mind now. I can go to bed knowing that my mom is taken care of. If I just want to check in but don’t have time to go visit her, I can go online and check the webcam and observe how are they doing there . I always get a good response and they’re very informative if I ask questions about how my mom’s day was. Staff is extremely accommodating and provides excellent reports about patient related issues. Administrator addresses any issues immediately to resolve them. Caregiver to patient ratio is the best around. We chose the Perryman House because there were a small number of residents per care giver, like two care givers for four ladies. They have double rooms, two persons in a room. It’s just like a home. The staff is excellent, very caring and loving, and they see to all of my mom’s needs. They have good meals, and snacks in between. There are a lot of memory stimulating games, they do puzzles, they read with them, and they have musical activities. I think The Almost Home Group is a wonderful place. It’s very small. It’s a house, and there are only six patients in there. I think the level of care is excellent. They seem to be taking really good care of the residents. Some days, they like the food. Some days, they don’t. They play a ball game with a larger ball like tossing it back and forth. Wonderful option for those with dementia, couldn’t have asked for better care for my grandmother! Almost Home Group has been a lifesaver for me. My wife was in advance stage of Alzheimer's. She was a little bit of a problem at other facilities she stayed previously and I was asked to move her. She could be a bit of liability to them. She does what other Alzheimer's patients do and they don’t want any liabilities or problems. Through a lawyer and a care broker, I was able to meet Cathy. They’re a blessing to us. The place is small with one on one care. The staff is all qualified, loving and caring. They’re certainly not there for the money. They just love what they do. All of their food are home cooked meals. They prefer any food my wife wants. The Almost Home Group agreed to care for my mother in her own home and I could not be more pleased with the quality of care and the quality of life my mother now has. Due to short-term memory issues that became evident followng a fall, Mom had lived for 2 years in an Assisted Living facility and we were living the all-too-common cycle of fall, go to the ER, stay in the hospital, go to rehab, return to the facility, fall again, etc. After thoroughly exploring options in the local area, and not finding any situation that was going to work very well for us (nothing was available with adequate supervision for folks with memory issues), we learned of The Almost Home Group. Having Mom in a situation where she has 24/7 one-on-one care in a nurturing environment has been such a blessing for our family. I (as the primary caregiver in the family) have actually been able to return to a somewhat normal lifestyle, because I know that my mother is content and safe. She has become physically stronger (no more trips to the ER - and it's been 3 months! ), emotionally more stable, and although we still have the memory issues, she is finally in a happy place! I would highly recommend this group of caregivers and wholeheartedly support their mission to revolutionize the eldercare industry! I could not be more pleased! 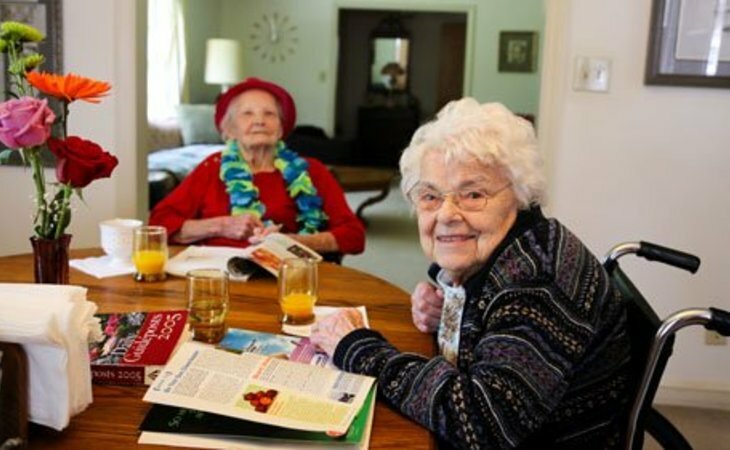 Describe the overall population of assisted living residents at The Perryman House. What is their average age? What are their favorite things to do? The Perryman House is a lovely brick ranch home in the prestigious Wallcliff Park neighborhood, just off Business 85 in Thomasville. What programs or activities does The Perryman House offer to enrich residents' well-being? Kathy Hatfield, the owner and Administrator of The Perryman House is also a NCCAP Nationally Certified Activity Director. There are also one full-time and one part time activity team members, as well as volunteers. Individual and group activities are available, commensurate with the needs of each specific resident and his or her preferences and abilities. What places are near The Perryman House or within walking distance for assisted living residents to enjoy? Wallcliff Park, equipped with a wheelchair path and picnic tables, is centrally located in the neighborhood with The Almost Home Group residences, including The Perryman House and The Lyman House. What transportation services does The Perryman House offer to assisted living residents? Private transportation is provided at no cost up to 30 miles one way. If a resident is wheelchair bound, local transportation is provided by a certified transport company for a nominal fee. What makes the chef or dining program at The Perryman House exceptional? What kind of menu can assisted living residents expect? The Perryman House provides three homemade meals and three (or more) snacks per day. We employ two local chefs, who specialize in delicious comfort food. What safety features or security measures does The Perryman House offer to assisted living residents? The Perryman House is equipped with a fire sprinkler system, a security alarm, motion detectors, floor alarms, and security cameras in all common areas of the home. How does The Perryman House keep residents' families informed about their loved ones? The owner and Administrator lives within 600 feet of The Perryman House, and is available to residents' families by phone 24 hours per day, seven days per week. What is the care staff-to-resident ratio at The Perryman House during daytime and nighttime hours? The staff of The Perryman House is 2 dementia trained caregivers for a maximum of six residents, providing a 1:3 ratio around the clock. If The Perryman House accepts dogs or cats, what indoor/outdoor areas can they enjoy? The Perryman House has visiting dogs, cats, and pigs. Resident pets are allowed if approved by the Administrator before move-in. Each caregiver is specifically trained to care for seniors with Alzheimer's and other types of dementia. Continuing Education is provided to each caregiver on a monthly basis. Describe the neighborhood around The Perryman House. Is it located in a residential neighborhood, a business district, a rural setting, or other type of locale? The Perryman House is located in the lovely Wallcliff Park neighborhood, one of the most prestigious in town. The lawns are manicured, and the streets are lined with oak trees and crepe myrtles. The Perryman House (by The Almost Home Group) is staffed by dementia-trained caregivers, with one (2) CNA or PCA for five (5) residents. Most caregivers are NC licensed Medication aides. Inspired by my Dad's journey through Alzheimer's, I learned that exceptional care for this delicate population is essential. Prices are all inclusive with the exception of co-pays, medication, and incontinence supplies. There are no LEVEL OF CARE price level increases... We treat our residents like our own family. What should caregivers and potential residents know about The Perryman House?